Our purpose is to shine a HUGE light on the fact that some in our legislature are planning with outside interests to bring TOLL ROADS to AZ in the very near future. A toll is just another tax, and we already pay one of the highest state gas taxes to maintain our roads in the country. Our state tax, added to the Federal gas tax, provides plenty of money to maintain our roadway system. The trouble is our government officials looks to the tax for other purposes. The more they tax, the more they spend. Where to sign petitions to fight the Toll Roads? The No Toll Roads Petitions are now available. Al Tracy, AAHC Pres., Tom Martin and Bill Gilmore AAHC Legislative Liaisons were on Call To Rights Radio Show KFNX Am 1100 at Noon, Saturday March 2nd. The Rally was a huge success. We met with 15 of 90 Legislatures and were on the TV and Radio coverage. Stay turned for more activities planned against Toll Roads. The AAHC , as well as other concerned groups staged a HUGE public rally against proposed TOLL ROADS in AZ. Our next step after the Rally was to file a proposition to Ban using publicly funded or maintained roadways in AZ for Toll Purposes. We now have the petitions for the Proposition available and must collect 260,000 signatures before 7/3/2014 to put the issue before the people and let them decide if they want Toll Roads in AZ. (When have they ever replaced a tax? Converting freeways into toll roads is one of the most popular types of project among transportation bureaucrats and certain politicians. When asked their opinion on the wisdom of tolling, voters have expressed a far different sentiment. In Washington state, for example, there is now no question that Initiative 1185, which took effect last December, will block a number of tolling projects that have been in the works.”There will be no unilateral increase in tolls by the Transportation Commission because the voters said no to agency-imposed increases in November,” initiative sponsor Tim Eyman said in a statement. “That means no tolls for 405 HOT lanes, no tolls for the Alaska Way Viaduct, no tolls for the Columbia River Crossing, and no toll increases on the Tacoma Narrows Bridge.”The initiative, which passed with the support of 64 percent of voters, does not directly ban tolls. Instead, it requires fee increases of any type (including tolls) to be approved in a bill duly passed by the legislature and signed into law. Some politicians have preferred tolling as a means of outsourcing unpopular increases to a third-party toll management company or, for publicly owned toll roads, to the state Transportation Commission, whose members are not accountable to the public. State Senator Pam Roach (R-Auburn), a major supporter of I-1185, asked the state attorney general for a ruling on which projects previously approved by the state now need specific legislative approval because they raise fees and tolls. In a response to Senator Roach, the state Office of Financial Management listed four tolling projects as off-the-table, unless the legislature specifically sets the tolls with a clear vote. December 4. 2012 – ATLANTA — Highway lanes that charge cars rising tolls as traffic increases are becoming the future for the USA’s clogged urban expressways. A dozen now operate across the nation and another 18 are under development. The so-called “dynamic pricing” lanes have just come to two of the biggest and most congested metro areas in the USA, Los Angeles and Washington, D.C. They join Atlanta, another notoriously congested city, and other metro areas where the roads — many called HOT (high-occupancy toll) lanes because carpoolers ride free — are growing in popularity after a rocky start. They also are planned or under construction on congested urban corridors from Seattle to El Paso, Dallas, Baltimore and other cities. Projects such as the ones in Los Angeles and Northern Virginia near Washington, which rolled out last month, likely represent the future of urban tolling in the USA because they allow transportation planners to get more mileage out of the existing highway system, experts say. “I think they do represent the wave of the future in the 10-15 largest urban areas,” says Bob Poole, director of transportation policy at the Reason Foundation, a libertarian policy research group. Some opponents criticize them as “Lexus lanes” — serving the wealthy while leaving others stuck in traffic. Others oppose the lanes because they’re on highways that motorists have already paid for with gas taxes and because the lanes are often turned over to private operators. “These public-private partnership deals generally are not in the best interest of motorists,” says Steve Carrellas of the National Motorists Association. 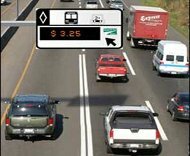 These toll lanes offer commuters congestion relief by using technology to adjust pricing constantly. Tolls rise as more people use the lanes and drop as demand falls. Carpools, bus riders and motorcyclists use the lanes for free. Most new toll projects in heavily traveled urban corridors around the USA employ real-time tolling, says Jim Ely, vice chairman of toll services for HNTB Corp., a national infrastructure firm. The L.A. and Washington projects are gradually gaining popularity with drivers after an initial period of confusion and some resistance. Officials in both places expect more motorists to try the lanes as they become more familiar with them. Overberg reported from McLean, Va. 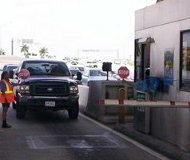 Motorists can be held indefinitely at toll booths if they pay with large denomination bills, according to a federal appeals court ruling handed down Wednesday. A family of drivers — Joel, Deborah and Robert Chandler — filed suit last year arguing they were effectively being held hostage by the Florida Department of Transportation (FDOT) and the private contractor in charge of the state’s toll road, Faneuil, Inc.Under FDOT policies in place at the time, motorists who paid with $50 bills, and occasionally even $5 bills, were not given permission to proceed until the toll collector filled out a “Bill Detection Report” with data about the motorist’s vehicle and details from his driver’s license. Many of those who chose to pay cash did so to avoid the privacy implications of installing a SunPass transponder that recorded their driving habits. They were likewise unwilling to provide personal information to the toll collector, but they had no alternative because the toll barrier would not be raised without compliance. FDOT policy does not allow passengers to exit their vehicle, and backing up is illegal and usually impossible while other cars wait behind. 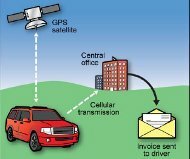 FDOT dropped the Bill Detection Reports in 2010.A three-judge panel of the Eleventh Circuit US Court of Appeals did not buy the argument that these motorist detentions rose to the level of a constitutional violation.”The fact that a person is not free to leave on his own terms at a given moment, however, does not, by itself, mean that the person has been ‘seized’ within the meaning of the Fourth Amendment,” the court wrote in its unsigned decision. “In Florida, a person’s right and liberty to use a highway is not absolute; it may be regulated in the public interest through reasonable and reasonably executed regulations.”The judges found it was reasonable for Fanueil to set regulations for use of the road — including the types of acceptable payment. The court decided that drivers implicitly agreed to those conditions by choosing to use the toll road.